The ability of Homo sapiens to kill prey at a distance is arguably one of the catalysts for our current ecological dominance. Despite the importance of projectile technology in human hunting strategies, there is still no consensus on when it first emerged. Many researchers have suggested its origins lie in the African Middle Stone Age (MSA) or Middle Palaeolithic (from ca 285–30 thousand years ago). Currently the largest body of evidence for the origins of projectiles is from the analysis of MSA stone points. There is a growing body of research focusing on zooarchaeological projectile impact marks in European assemblages; however, comparable investigations are currently lacking for the MSA. The criteria for identifying projectile impact marks on bone is not standardised, and no large experimental studies exist that examine marks left by MSA points specifically. Therefore, a clear analytical framework must be created through experimental samples of such points. Using replica MSA prepared core points and Howiesons Poort segments—both of which were present during the southern African MSA—this paper defines the various forms of marks on bone caused by stone artefacts commonly considered to have been used as projectiles at this time. When applied to the archaeological record itself, these results suggest that the earliest direct evidence for hunting practices in southern African MSA deposits dates to around 160–90 ka. 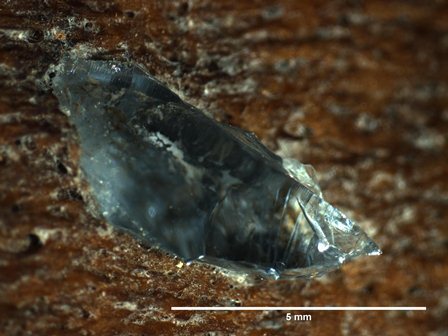 Image caption: Puncture wound with stone embedded in rib caused by experimental lithic projectile (image courtesy of Tammy Purssell).